For anyone following New Record Day, they already know if there was such thing of a “Rogue Audio fan-boy”, I would be first in line to buy the shirt. The Cronus Magnum review is one of the most popular reviews I have done and it’s recognition is well deserved. 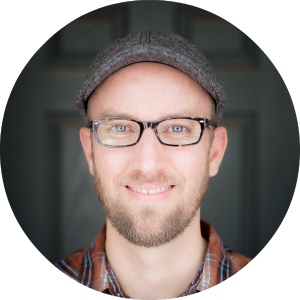 After many conversations and emails to Mark Obrien, we made the decision to check out gear that is supposed to be transcend the Cronus in every possible way. Does the 99 Super Magnum and Stereo 100 kick the door down or end up with return shipping labels headed back to Mark? Check out the review and find out! Entirely designed and built in the U.S.A.
Thats right folks, the time has finally come to check out what happens when I yank out the Cronus from the system and move into the realm of separate components. I know I previously mentioned that I was interested in doing a review of the Rogue Pharaoh but after talking with Mark Obrien, we decided to move in a much bolder direction. Generally speaking, the benefit of having separate components is each piece will have their own power supply which can result in increased dynamics. Also taken into consideration is the extra space to focus on better designs without having to cram everything into one box and make compromises. Setting the tube bias on the Stereo 100 was step 1 in this adventure and just like the Cronus Magnum, the process is pain free and easy to do. Simply remove the tube cage with a phillips screwdriver and seat the tubes in the correct valve positions marked 1 through 4. Making sure you connect your speakers, turn on the amp and wait for 15 minutes as things warm up and you are ready to rock and roll. Oh, make sure your volume knob is turned all the way down while setting the bias. With the supplied bias tool, I was able to lock in the KT120s to 40millivolts which has remained stable for the last 2 months of listening to this bad boy. For detailed instructions on setting the bias, you can check out my other reviews of the cronus as the process is the same. I will also post the instructions on the review page. 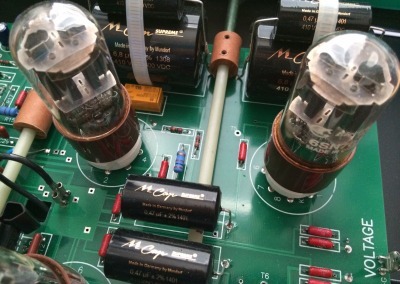 The Ninety Nine Super Magnum is an all tube preamplifier that features 4 6SN7 tubes and an optional phono section which I passed up as I am using separate components for phono amplification. Front panel consist of power, mute, mono, and record buttons. mono simply combines the left and right channels and the record button allows you use either a fixed or variable signal from the rear RCA jacks in the back. Headphone jack, 5 RCA inputs and 2 outputs on the rear are all well made and laid out with plenty of room for any size connector out there. Plugging in the 2 umbilical power cords is pretty simple as they can only go in one way but ill be the first to report that they seem a little fussy. More often then I would like, the pins don’t seem to make contact and the unit won’t turn on unless I fiddle around with it. All knobs and pots on the 99 feel great and I had no other issues with things not working well during the review so all in all, this preamp continues to show the last thing you need to worry about with rogue is build quality. 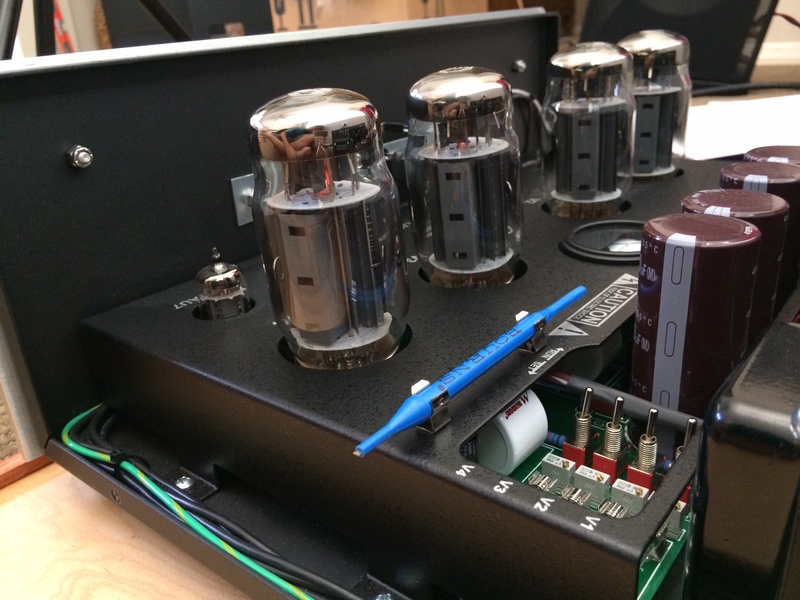 The Stereo 100 is a beastly 65 pound all tube amp featuring KT120 output tubes that can also be swapped for KT88s. 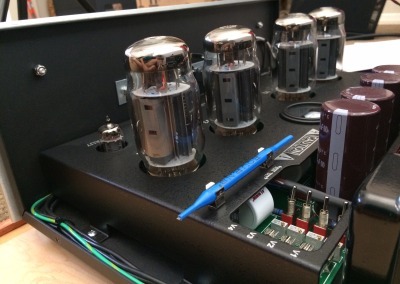 Featuring 4 and 8 ohm taps on the back, XLR and RCA input jacks and a switch for ultra linear or triode settings make this amp suitable for just about anyoine looking for some serious horsepower added to their rig. Frequency response comes in 5hz to 50khz, total harmonic distortion less than 0.1% and offers 100 watts of pure musical enjoyment. Everything on the Stereo 100 feels well made and strong as an ox, the 5 way binding posts are high quality and nothing about this amp feels cheap or thrown together in a hurry. The first time I heard the 99 Super Magnum and the stereo 100 in my room I knew that any concerns i had of this system possibly sounding similiar or like my cronus were instantly shattered. Not that sounding like the Cronus would be a bad thing but its important to understand this system is significantly more expensive than the integrated cronus so it really had something to prove to convince me the money is well spent. The first thing out of the gate i noticed was increased dynamics, stronger mid bass and deeper bass extension. For the first week or so I thought the new rig was warmer sounding than the cronus but I was wrong, there was just a lot more umph and authority in the mid bass to fill in some of the gaps and crevices the cronus left open. The top end of this rig has more clarity and a razor sharp focus throughout the soundstage. While I felt the background on the Cronus was pretty dang dark, this sucker is pitch black and music pops literally out of nowhere. According to the manual and emails to Mark, the reason this selector knob exists in the first place is offer versatility for source and speaker matching. 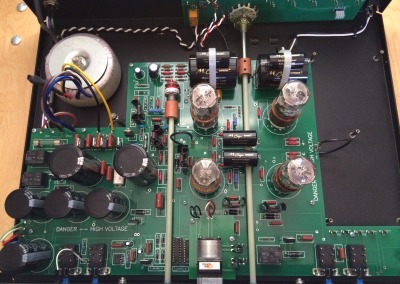 Look at it this way, the global gain is simply a ladder attenuator that lowers the signal level going into the preamp. 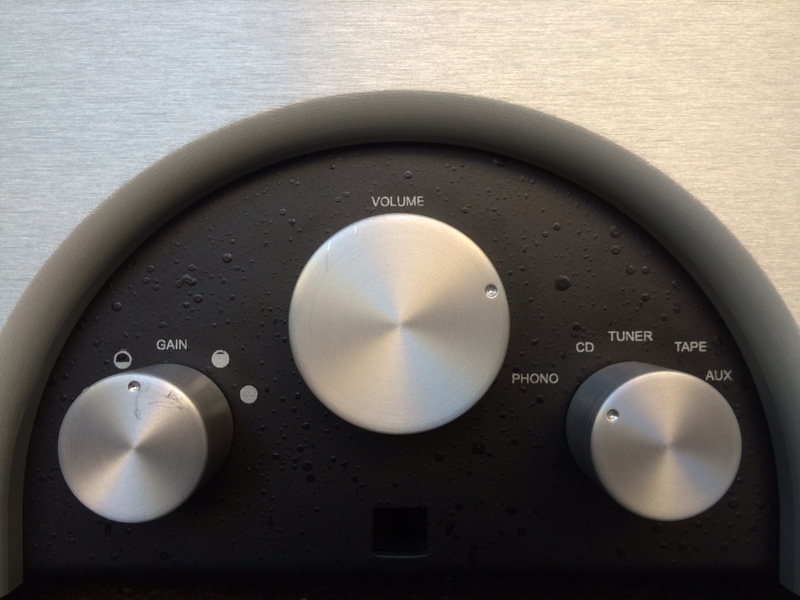 Basically folks, this is a knob that allows you to control how sensitive the Volume is and thats the bottom line. 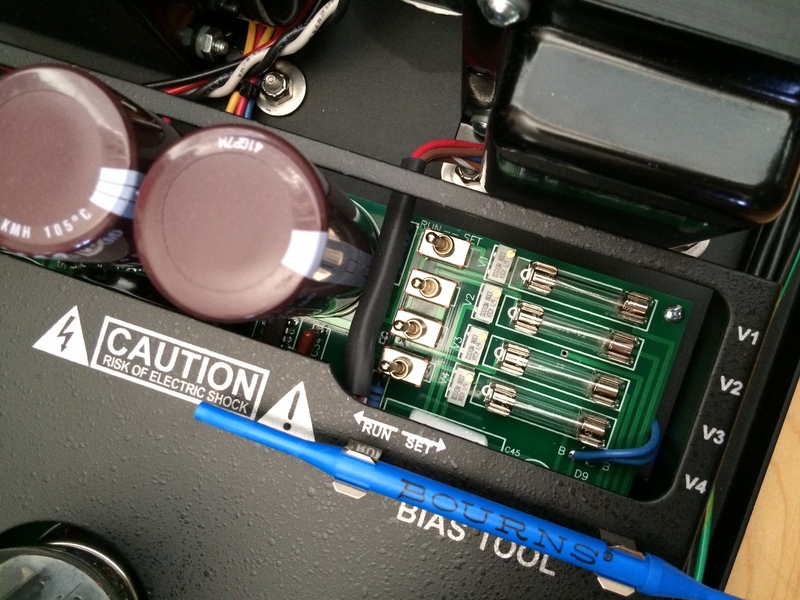 Rogue is using a high quality Grayhill switch and Vishay resistors to accomplish this task and because the preamps gain is very high, it needs to be attenuated to be useful. 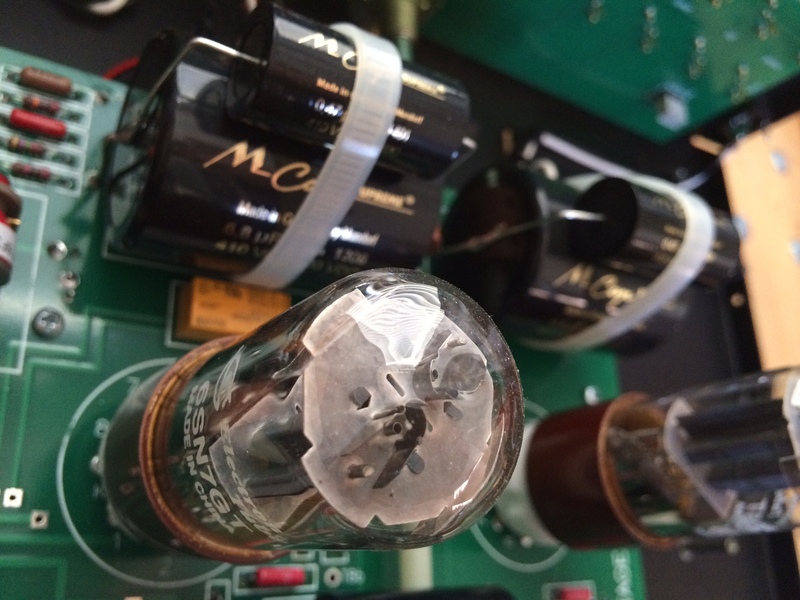 So, if you happen to have very high or low efficiency speakers or a low output source, you won’t have a volume knob that is either blasting at 10:00 or doesn’t give you the juice needed until its cranked… I think the biggest concern audiophiles will have with this feature is the fear of attenuating anything that has to do with the signal coming into the preamp as opposed to the gain itself. 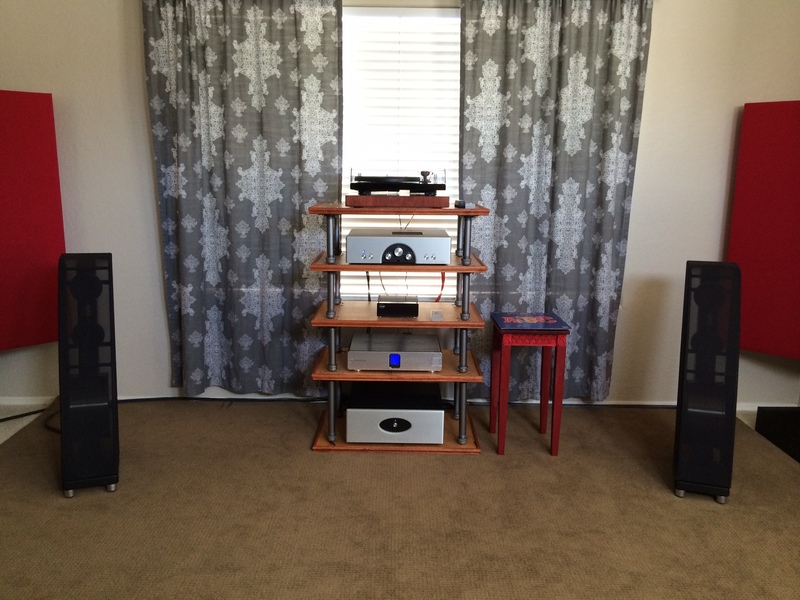 So… I decided to do what New Record Day does best and put it to the test. 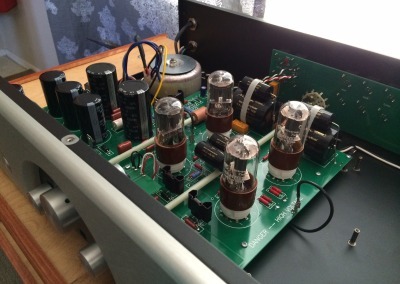 On the review page, you can check out 5 high resolution samples of recordings made using the different gain settings. Ill cut to the chase, good look hearing any difference at all cause I can’t after a number of tries and failures. 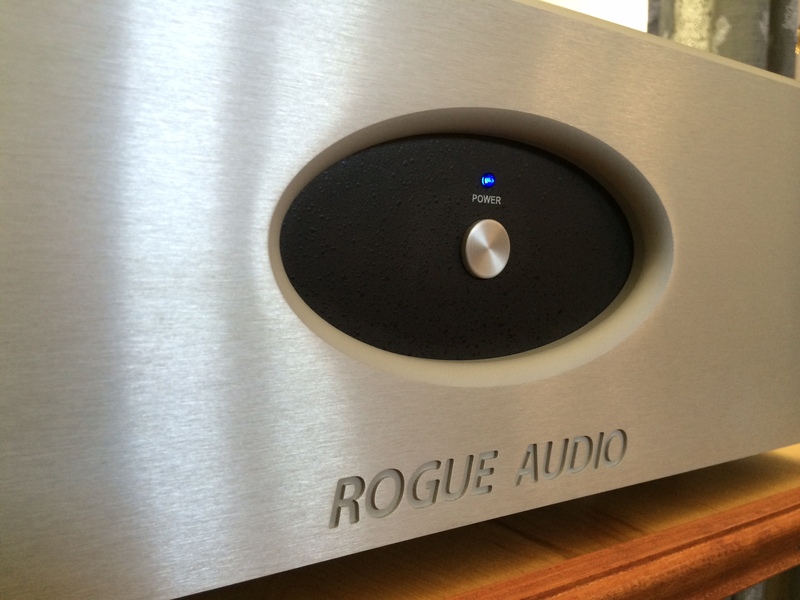 Bottom line, Rogue took care of our signal and the everything sounds just fine. Treble on 99 super magnum sounds a little pronounced in such a fashion that comparing it to ruler flat Manley Shrimp, you do end up with a sound that could be described as a couple notches north on the brighter side of the sun. Now, I’m not talking about ear screeching, run for your ear plugs kind of nonsense, I am referring to tip top extensions have a little extra flair than neutral. So, if you find yourself with a warmer sounding system, this preamp could liven up the sound just enough to breath some life into the mix. 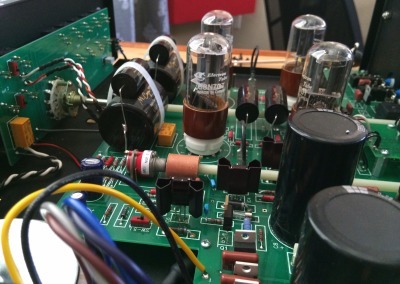 Tossing in the First Watt B1 passive preamp validated that the stereo 100 with the KT120s also tilts a little more on the detailed side of the swimming pool and I wouldn’t make the mistake of describing this amps top end as dark or warm. If you are looking for tube amp that is more on the analytical side of the spectrum in treble town I can’t see you making a mistake here. Toss in the fact that you could tube swap to KT88s, things could get interesting. while I don’t think it will radically change the color we are looking at, you could end up with a different shade of the same color and that might not be a bad thing depending on what you want out of your system. All in all I would describe the combo as a couple notches on the brighter side if the audio spectrum. While the midrange of the 99 is certainly reference level by most standards, I preferred the competition of the Manley Shrimp a little more. It sounded to me like the Manley had just a little more meat on the bones which helped certain instruments jump out of the mix like a holographic image that you could reach out and grab. On both units, vocals were presented with terrific precision, cutting through the mix and anchoring itself right in the pocket of musical perfection. While id probably give the 1st place ribbon to the rogue in overall details in the midrange presentation, id still say the rogue sounded slightly leaner than the Manley and my gut tells me the shrimp would probably be easier on the ears in long term listening sessions. Keep in mind here folks, these differences are very small and should be taken as such. Trying out the B1 with the Stereo 100 confirmed that while the KT120s are crystal clear on the top end and to some might even be considered a little bright, the midrange doesn’t exactly follow the same suit. 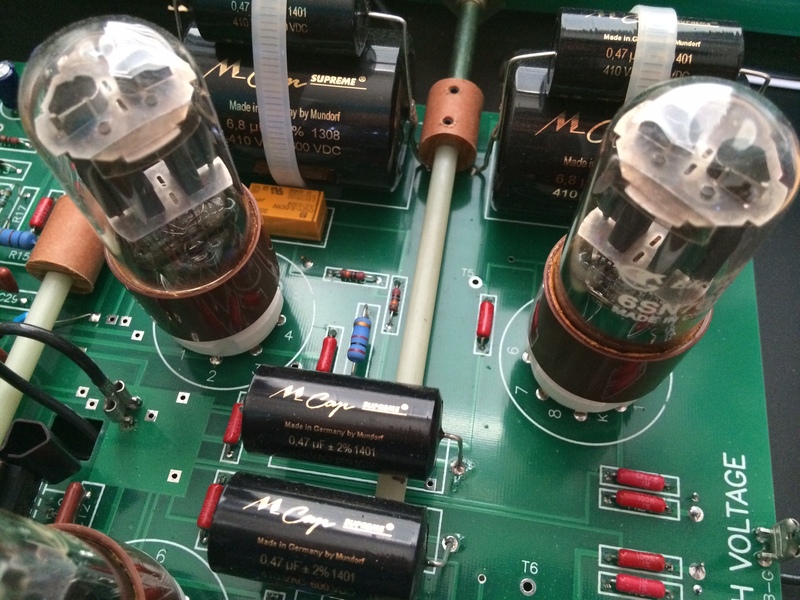 If anything, the midrange reminded me of what I loved so much about my Cronus Integrated Amplifier so much, textures and body of anything well recorded sounds absolutely spot on without a hint of graininess. Vocals are presented with authority and have enough guts to please the most demanding listener. Bass heads would probably lean in favor of the Rogue as I found there to be a little more heft and weight in the Super 99 than the Shrimp. This really got my wheels turning that perhaps the Super 99 might be suited for the listener who wants a dash more top and bottom and are willing to sacrifice a small portion of midrange magic to get there. While checking out a number of bass tracks, I was amazed at just how much authority pours out of this rig and there were times when the only reaction that was happening was me sitting there giggling with a giant grin on my face. Where this muscle is coming from was obvious the second I went back to the first watt B1 and was left with glowing KT120s staring back at me, ready for more. 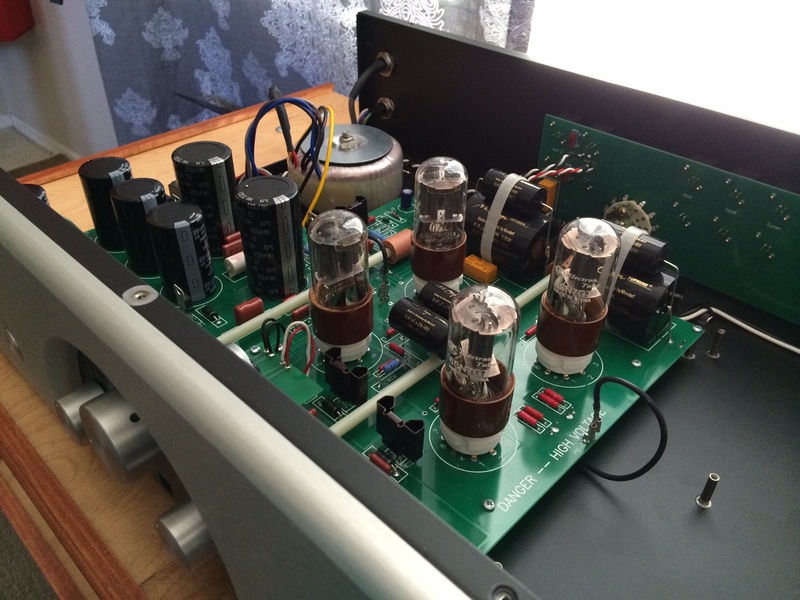 This Stereo 100 will rip your face off folks. If you are looking for ground smashing bass that will keep its cool under pressure and never sound bloated or boomy, I can’t see how you could possibly go wrong here. If there is one big difference between this combo and my old cronus, the bass and slam would be 1st in line. To be blunt, as good as the bass is on the Cronus, this combo packs its lunch and sends it back to mommy. Soundstage is incredibly impressive on both the 99 and stereo 100 and with the recent addition of my VPI Classic 2, I will be clear in saying my room has never sounded so wide and tall. Edge to edge sonics with laser beam accuracy is how I would describe these 2 incredible pieces of equipment. Shaking things up, I tried out the shrimp in the mix and found that the extra meat in the mids help create the best sounding stage I have ever heard in my house. That was a combo I could enjoy all day long. 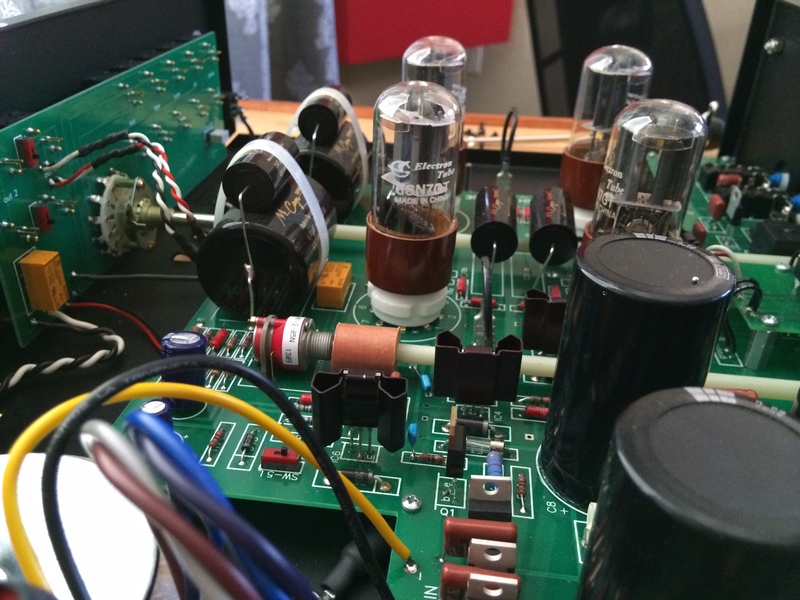 Trying to localize where all this magic was coming from, I decided to toss in the Emerald Physics 100.2 SE amp thats still hanging around from the CS2P review and let me tell you, that exercise didn’t last very long at all. Everything I heard that was huge, dynamic and punchy, turned to thin, lifeless, and dark. I realized that while the shrimp is one heck of a preamp and showed up the party ready to rock, the emerald passed out drunk long before things got interesting. 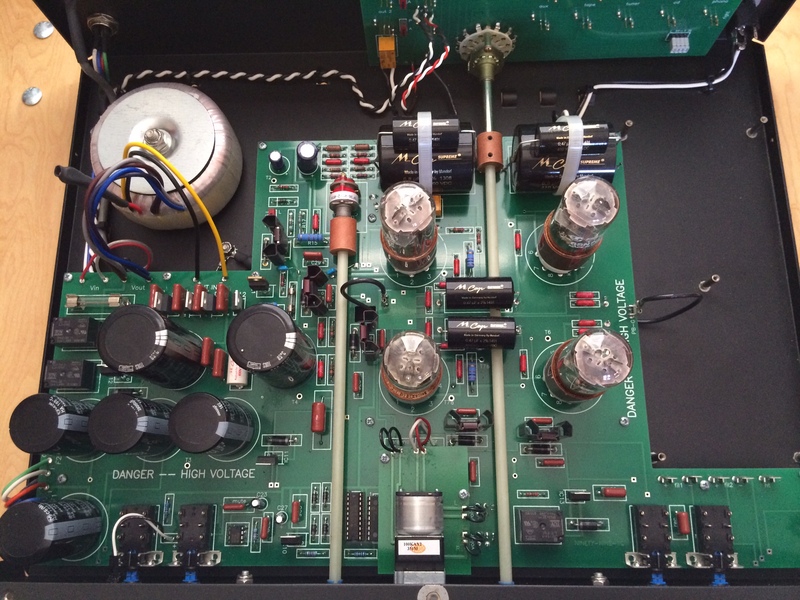 This just goes to show how important a power amplifier really is and shouldn’t be overlooked when putting a system together. 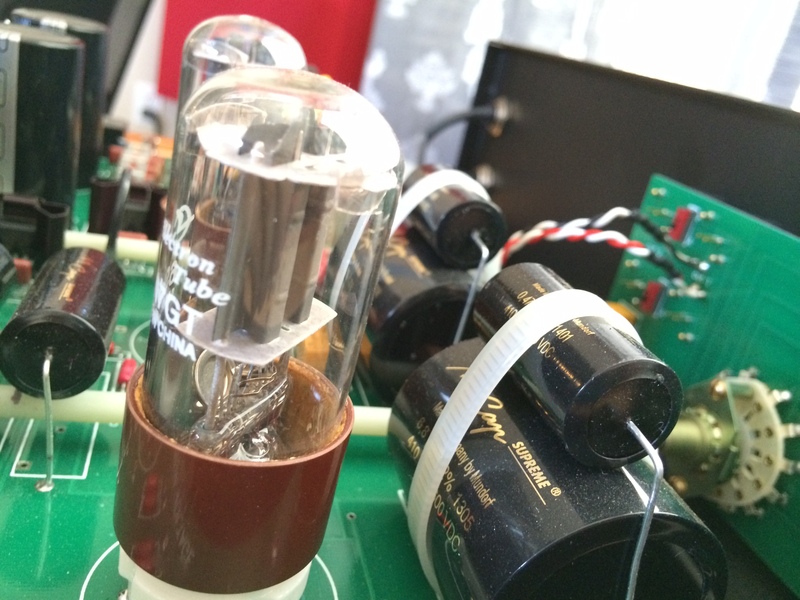 For those curious, I wish I could tell you that in all my listening that I have done, id be able to describe the obvious sonic differences between the ultra linear and triode settings but the truth is, it was tough to tell enough of a difference to spend a lot of time covering. If anything, I found that the ultra linear worked better in my rig 75% of the time especially when I wanted a big, bold sound and get the walls rumbling. For those quiet nights when Sarah was sleeping, I would try the triode setting and perhaps there was just a tad more detail. Bottom line, after hearing what this amp can do with either setting, I wouldn’t obsess over that particular feature if you are in the market for the Stereo 100.
your dealer and have them bias the amplifier for you. 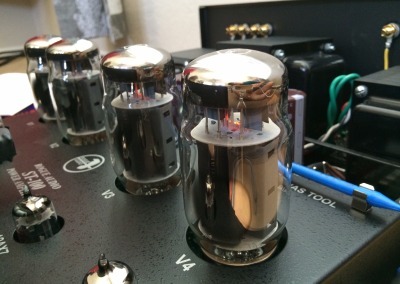 1) Allow the amplifier to warm up for at least 15 minutes. bias tool clipped into the cover. 5) Each switch has two positions; set and run. 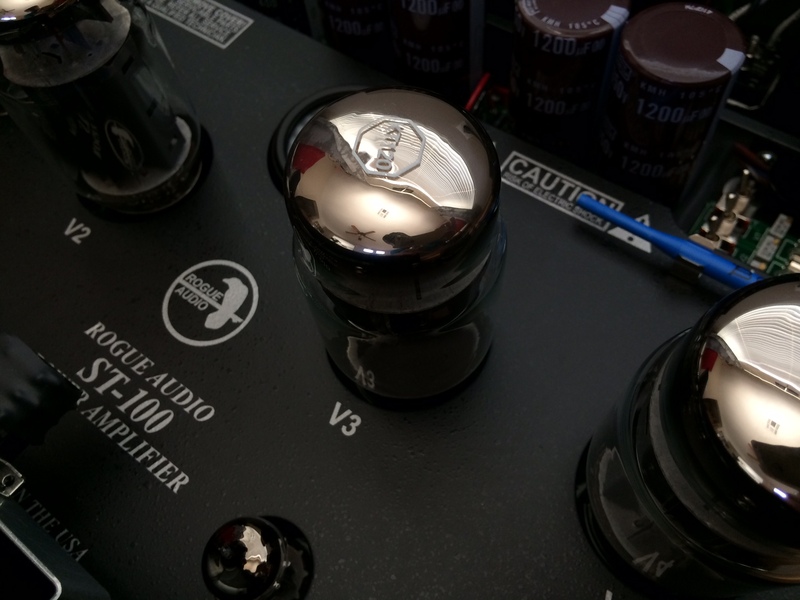 6) Beginning with V1, move the V1 toggle switch into the set position. facilitate this operation. Move the toggle switch back into the run position. 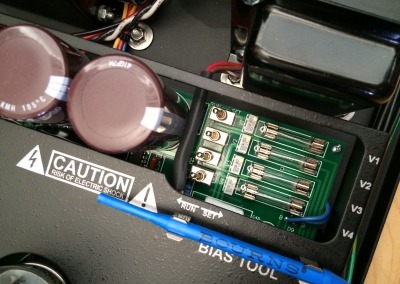 8) Repeat the above steps for each of the other three output tubes.